Digg.com is having one of its Apple fanboy days, where every other story on the Digg homepage could have been submitted by the Apple PR department. A story published by Wired on Steve Jobs’ best quotes illustrates this, making it onto the Digg homepage and racking up hundreds of diggs in next to no time. As I write, there are no less than four pro-Apple stories in the top ten of Digg’s technology homepage. Wisdom of crowds, huh? We wondered what would happen if we balanced this view with a similar piece on Macboy nemesis Bill Gates. After the jump we’ve culled a bunch of Bill’s quotes, 36 in total, including a gem about spider monkeys. 1. Your most unhappy customers are your greatest source of learning. 2. At Microsoft there are lots of brilliant ideas but the image is that they all come from the top – I’m afraid that’s not quite right. 3. The first rule of any technology used in a business is that automation applied to an efficient operation will magnify the efficiency. The second is that automation applied to an inefficient operation will magnify the inefficiency. 4. Intellectual property has the shelf life of a banana. 5. People always fear change. People feared electricity when it was invented, didn’t they? People feared coal, they feared gas-powered engines. There will always be ignorance, and ignorance leads to fear. But with time, people will come to accept their silicon masters. The two areas that are changing are information technology and medical technology. Those are the things that the world will be very different 20 years from now than it is today. 6. The internet will help achieve “friction free capitalism” by putting buyer and seller in direct contact and providing more information to both about each other. 7. Make it just like a Mac. 8. Measuring programming progress by lines of code is like measuring aircraft building progress by weight. 9. I think it’s fair to say that personal computers have become the most empowering tool we’ve ever created. They’re tools of communication, they’re tools of creativity, and they can be shaped by their user. 10. We are not even close to finishing the basic dream of what the PC can be. 11. So we do software for watches, for phones, for TV sets, for cars. And some of these take a long time to catch on. 12. I think it’s fair to say that personal computers have become the most empowering tool we’ve ever created. They’re tools of communication, they’re tools of creativity, and they can be shaped by their user. 13. In the decade ahead I can predict that we will provide over twice the productivity improvement that we provided in the ’90s. 14. Some people read off of their Palms and Pocket PCs, but the real immersible reading experience takes a full-screen device. 15. People everywhere love Windows. 16. Windows 2000 already contains features such as the human discipline component, where the PC can send an electric shock through the keyboard if the human does something that does not please Windows. 17. We’re responsible for the creation of the PC industry. The whole idea of compatible machines and lots of software.. that’s something we brought to computing. And so it’s a responsibility for us to make sure that things like security don’t get in the way of that dream. 18. When the PC was launched, people knew it was important. 19. Just in terms of allocation of time resources, religion is not very efficient. There’s a lot more I could be doing on a Sunday morning. 20. Capitalism is this wonderful thing that motivates people, it causes wonderful inventions to be done. But in this area of diseases of the world at large, it’s really let us down. 21. I do think this next century, hopefully, will be about a more global view. Where you don’t just think, yes my country is doing well, but you think about the world at large. 22. If you show people the problems and you show people the solutions they will be moved to act. 23. As we look ahead into the next century, leaders will be those who empower others. 24. Life is not fair; get used to it. 25. The U.S. couldn’t even get rid of Saddam Hussein. And we all know that the EU is just a passing fad. They’ll be killing each other again in less than a year. I’m sick to death of all these fascist lawsuits. 26. Let’s face it, the average computer user has the brain of a Spider Monkey. 27. I have 100 billion dollars… You realize I could spend 3 million dollars a day, every day, for the next 100 years? And that’s if I don’t make another dime. Tell you what-I’ll buy your right arm for a million dollars. I give you a million bucks, and I get to sever your arm right here. 28. Success is a lousy teacher. It seduces smart people into thinking they can’t lose. 29. In this business, by the time you realise you’re in trouble, it’s too late to save yourself. Unless you’re running scared all the time, you’re gone. 30. I’m sorry that we have to have a Washington presence. We thrived during our first 16 years without any of this. I never made a political visit to Washington and we had no people here. It wasn’t on our radar screen. We were just making great software. 31. About three million computers get sold every year in China, but people don’t pay for the software. Someday they will, though. As long as they are going to steal it, we want them to steal ours. They’ll get sort of addicted, and then we’ll somehow figure out how to collect sometime in the next decade. 32. There are people who don’t like capitalism, and people who don’t like PCs. But there’s no one who likes the PC who doesn’t like Microsoft. 33. 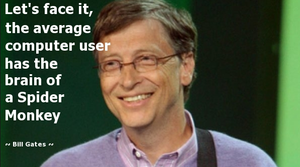 Microsoft is not about greed. It’s about innovation and fairness. 34. To create a new standard, it takes something that’s not just a little bit different; it takes something that’s really new and really captures people’s imagination — and the Macintosh, of all the machines I’ve ever seen, is the only one that meets that standard. 35. The best way to prepare [to be a programmer] is to write programs, and to study great programs that other people have written. In my case, I went to the garbage cans at the Computer Science Center and fished out listings of their operating system. 36. We will never make a 32-bit operating system, but I’ll always love IBM. * Quotes from various sources including WikiQuote, BrainyQuote and Woopidoo. ** The Wired article is here, for Steve Jobs fans. iPod killers for Christmas 2006? Richard Menta at mp3newswire has been reviewing potential ‘iPod killers’ since 2004 and he rounds up the potential challengers for Apple’s crown in the run up to the Christmas shopping season. Of the 149 portable MP3 players he has reported on in the past two years, not one has yet managed to dent the popularity of Apple’s device, which has become a generic name for the MP3 player. Google is planning another foray into the offline advertising market by extending its AdWords system to print media. The search giant has invited 100 advertisers to test out the Print Ads service, which will initially broker space in newspapers in the US.